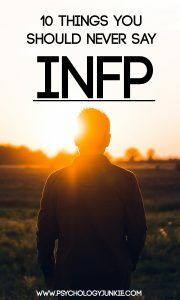 INFPs are known for being patient, passionate, and caring individuals. 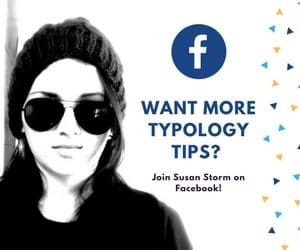 If you open many typology books you’ll read about how they are accepting, open-minded and sincere. Even so, there are certain phrases that really get on their nerves. They may not over-react or call someone out when careless words are spoken, but they will gradually put up guards against people who are condescending, cruel, or belittling. According to neuroscience, INFPs show high activity in brain regions that process verbal expression and language to find specific words fitting a situation. They don’t just spew out the first thoughts that comes to their mind; they are careful and conscientious. Because they are so careful with how they speak, it can be frustrating for them to live in a world where few other people consider their words as carefully. So without further ado, here are some phrases you should never say to an INFP. INFPs lead with a process called Introverted Feeling (Fi). Fi is deeply emotional, but it’s also deeply private (hence it’s introverted direction). INFPs are strongly affected by troubles in the world, by cruelty, bullying, or harsh words. They may seem more emotionally impacted than other types; however, because they prefer to keep their emotions more private they also feel frustrated when their reactions show. Saying they’re feeling something “too strongly” is a sure way to frustrate them and build walls in your communication. If they’re being emotional because they are stirred by something and they are trying to make a point, trying to downplay their values or their passion will only wreak havoc on your relationship with them. If they are speaking up about something that moves them emotionally it’s time to listen; condescension will get you nowhere. Healthy, balanced INFPs have a moral integrity that is hard to corrupt or change. They believe in being true to their values and standing up for their beliefs and ideals. They have no desire to gossip or make jokes at other people’s expense and they are deeply affected by cruelty and corruption in the world. Certain people misinterpret their idealism as weakness or naivety, when it is anything but. INFPs are often more than aware of the harsh realities of the world. But they choose to hope for something better for themselves and for the future. Trying to change them or to “educate” them on the ways of the world will just seem condescending. Prefacing an insult or critique by saying “don’t take this personally” will only make INFPs feel belittled and irritated. INFPs are more than happy to get constructive criticism, but it needs to be done in a way that isn’t patronizing. Zen habits has an amazing article on how to give constructive criticism kindly. They already know this. Pointing this out really doesn’t help. To be honest, does anyone actually like hearing this? INFPs are programmed to find deeper meanings. They look for symbolism, patterns, and connections between ideas that build to a holistic understanding of the universe. They truly enjoy finding deeper significance behind real-life scenarios, music, movies, and storylines. Taking the depth, the mystery, and the gravity away from things is unnatural to them. INFPs are known for their vivid imaginations and their longing to explore new theoretical ideas and avenues of thought. They have a childlike wonder about the world and about possibilities in it. Some people feel it’s their duty to “bring them down to earth” and force them to confront the concrete realities of daily life. This kind of patronizing tone completely ignores the imaginative and creative gifts that INFPs bring to life. INFPs yearn to understand and to “get in the shoes” of other people. Don’t dismiss their concerns or input without giving them a chance to at least try to understand. They are exceptional listeners. Adhering to a rule or demand just because an authority figure “says so” isn’t natural for an INFP. They need reasons, especially if their conscience conflicts with the directions given. Because INFPs have a strongly value-focused function (introverted feeling) and because they think outside the box (via extraverted intuition) they’re likely to question and confront ideas that seem rigid, don’t feel right, or don’t align with what they believe in. INFPs are very individualistic people. They believe that everyone has a unique personality and that people shouldn’t be compared or held up to a pre-ordained set of standards. They try not to compare people and they dislike it when people compare them. Do these phrases bother you? Do you have any other ideas of what not to say? Let me know in the comments! If anybody says “You seem like a nice person” to me it immediately sends up a red flag. Usually it means—u r an easy mark! It kind of bothers me if people tell me that I’m taking things they say too seriously. Its really hard to tell when someone is joking or not unless they give obvious hints in their vocal tonality. I don’t want to be the person that laughs at everything and ends up laughing at the wrong things, you know?